People who suffer from snoring or sleep apnea have a less restful sleep. It also disturbs other family members. There are a number of treatments for snoring: chinstraps, breathing devices--even surgery. 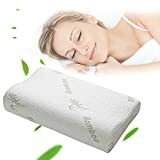 If snoring is a problem for you, getting an anti-snore pillow is one of the easiest ways of treating it. They are constructed in such a way so as to increase the chances of leaving the airways open in the throat, to prevent snoring. Side-sleeping pillow: If you sleep on your side, you already reduce the chances of snoring. But a side-sleeping anti-snore pillow elevates the head slightly, to help keep the tongue and uvula from clogging the breathing passages. 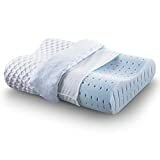 The SleepRight Side Sleeper pillow has a full facial cradle (to reduce pressure on the jaw and ear), a shoulder cradle (to align the spine), and depressions to the left and right (that they call "air paths"), that help you breathe whether you prefer sleeping on your right or left side. 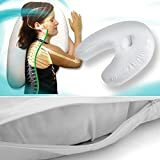 Cervical pillow: This is a pillow for people who sleep on their back. It has a curved design that elevates the neck and head while sleeping on your back. Wedge pillow: This is also for people who sleep on their back. It has a triangular shape to elevate the back, neck and head. That also is a means of keeping the tongue from obstructing the throat. 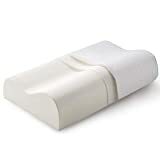 Aeris makes a memory foam bed wedge pillow that is designed to alleviate snoring, as well as acid reflux and back and neck pain. Depth of the pillow: People say that they prefer the SleepRight 4-inch thick pillow, but this is of course a matter of taste. The most important thing is that the thickness of the pillow allows your neck to be in a comfortable position. 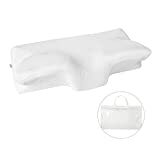 Bicor makes an inflatable pillow--this way, you can get the pillow to exactly the thickness that is optimal for you. 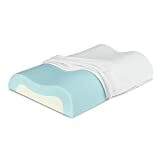 The Tri-Core Cervical Pillow has different thicknesses on each side of the pillow. This allows you to rotate the pillow to the thickness that you prefer. Various sizes: SleepRight offers pillows in various sizes: small and medium for travel, as well as small, medium and large. You should select the size of the pillow according to your height and the width of your frame. 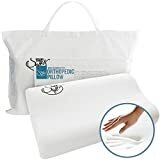 Materials: Anti-snoring pillows will usually be made from polyurethane, or memory foam (which is polyurethane with special additives to increase its viscosity. You’ll also see pillows from cotton or polyester fibers, which are hypoallergenic (allergies can also impede breathing passages, and worsen snoring). Removable cover: It is important that you are able to remove the cover. It will have to be laundered from time to time, to avoid accumulation of mites, dust and pollen. Splintek--SleepRight--is a sleeping aid company based in Kansas City, Missouri, that was founded in 1995. Their products include a dental guard (for people who tend to grind their teeth while sleeping), a breathing aid to reduce nasal congestion, a tongue cleaner (to remove odor-causing bacteria from the tongue), and a side-sleeping pillow (to prevent snoring). Splintek was founded in 1996, and it markets a number of products under the name “SleepRight”. Their products are all FDA-approved. Bicor Pillows-- has its headquarters in Brooklyn, New York. 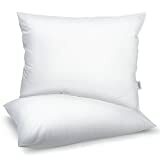 They make bed pillows, orthopedic and medical pillows, and pillow inserts. 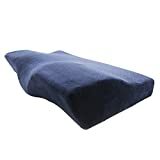 Their orthopedic pillows can relieve pain from the lower back, hips and knees. Their "snore less" pillow is an inflatable pillow, that allows you to pump it up to the right size that you find comfortable. It allows you to align your head, neck and shoulders so as to avoid snoring. Hermell Products--was founded in 1969 by Dr. Herman Pollack. His first product was to develop a soft bandage for podiatry patients, but he quickly expanded to making cushions that support the back and neck, orthopedic products, cooling gel pillows, and anti-snoring pillows.